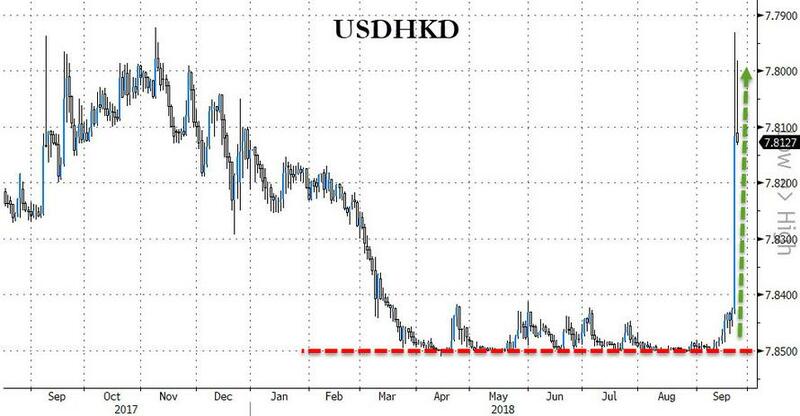 After more than five months of trading at or near the lower band of its currency peg (prompting repeated interventions by the city’s de facto central bank), the Hong Kong Dollar exploded stronger last week, imploding short-HKD carry traders and the carnage is for all to see tonight as HK liquidity markets are in crisis. 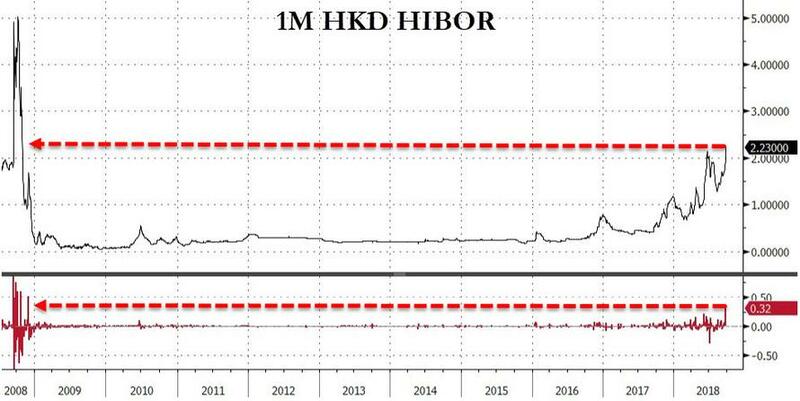 As Bloomberg reports, a shock jump in Hong Kong’s currency is signaling a decade-long liquidity party is coming to an end. That may be bad news for the city’s housing market. 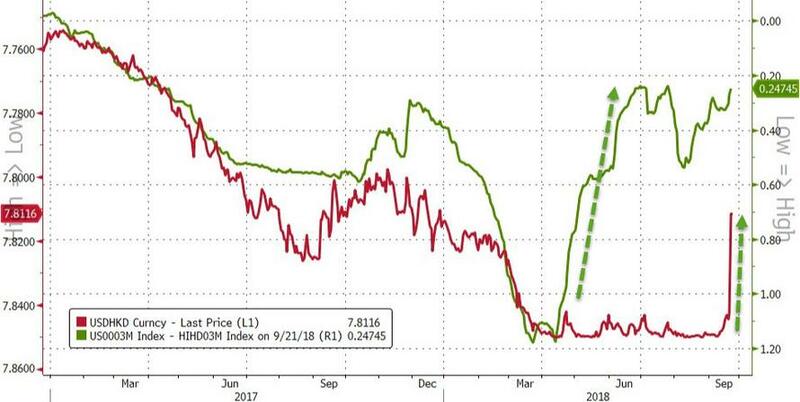 The chance of local banks raising the so-called prime rate for the first time since 2006 is “extremely high,” Financial Secretary Paul Chan said. 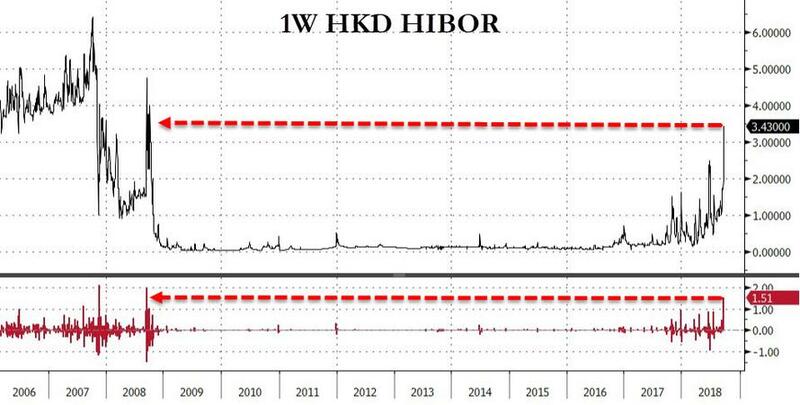 The Hong Kong dollar’s one-month interbank borrowing costs jumped the most since 2008, as the Lehman crisis escalated. 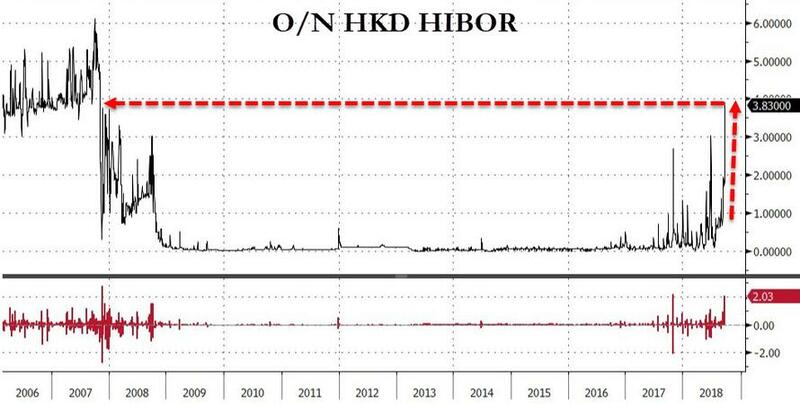 “The market has underestimated the pace of interest rate increases in Hong Kong,” said Kevin Lai, chief economist for Asia ex-Japan at Daiwa Capital Markets Hong Kong Ltd.
“We expect banks to hike prime rate twice this year by a total of 50 basis points, as Hibor rises with a shrinking liquidity pool and Fed hikes,” said Frank Lee, acting chief investment officer for North Asia at DBS Bank (HK) Ltd.
And the narrowing spread with U.S. Libor (green) is making a previously profitable trade of selling Hong Kong dollars to buy higher yielding U.S. assets less appealing.